I'm a little late getting to this news, but I wanted to share it just in case anyone missed it, because I think it's a major step forward for the publisher. I've known for some time that Action Lab was trying to get onto Comixology, especially once Princeless became an Eisner nominee. I also know that Comixology has been trying to delve further into the pool of small press and indie comics, an area in which they are currently sorely lacking. In slowly becoming *the* destination for digital comics, the distribution service has worked hard to gather all the major names together and create the day and date digital phenomenon. However, it has not been the best at helping the lower-level titles thrive, as a lot of their attention has gone to Marvel, DC, Image, and IDW. I don't blame Comixology for this, by the way, as it's a smart business practice. However, I am glad to see that now that trying to be the #1 provider of digital comics is safely in their hands that they're trying to reach out and be the place to go for those who aren't interested in capes and tights. The more that people who stop by for Saga have to to choose from, the more Comixology can continue to grow. There is still work to be done, however, as the new marriage quickly shows. I tried to find Action Lab under "publishers" and it did not exist. For now, at least, Action Lab's books are in the nebulous "Creator Owned Comics" section, mixed with collected webcomics, Alex de Campi's pioneering Valentine, and others. 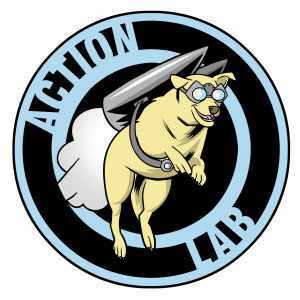 Unfortunately, this also means that searching for "action lab" brings up no results at all, as the publisher is also listed as "creator owned." You have to work to find them, which isn't a problem for dedicated buyers, but is going to cost them casual sales until this is fixed. It's my opinion that would be in the best interests of both Action Lab *and* Comixology. Kevin Freeman, the President of Action Lab, is clearly excited about joining Comixology, and rightfully so. "We are looking forward to a long and mutually beneficial relationship with ComiXology," he states in the press release. I am, too, as I hope it marks a turning point in Comixology's approach to comics without movie-ready characters in them.